Young soccer players can now get a handle on their ball handling skills with the new SoccerGrip from SoccerEdge. SoccerGrip helps them hold onto the ball. SoccerEdge has always helped young players work on their shooting skills and now SoccerGrip helps them practice their ball control skills too. Boston based SoccerEdge Inc. has added the new SoccerGrip handheld soccer trainer to its SoccerEdge bungee soccer trainer product. Customers now get two soccer trainers with their purchase of SoccerEdge. “Hold onto the ball!” It’s a common cry heard from the sidelines of youth soccer fields across the nation. 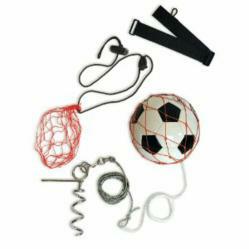 SoccerGrip is a handheld soccer trainer that allows a young player to use their own soccer ball, of any size, placing it in a net attached to an adjustable length cord that has a handle at the end. The player can then hold onto the ball in the net and practice their dribbling, juggling, and ball control skills. This is in contrast to the original SoccerEdge product that helps with increasing strength and accuracy of shots, passes, free kicks and throw-ins. SoccerEdge bungee soccer trainer utilizes a corkscrew stake that anchors a ten foot bungee cord with a net at the end for any size soccer ball. The player can then kick the ball and it returns to them via the bungee cord. The result is a device that allows a player to get many touches on the ball in a short amount of time. No more chasing the ball.